A short post as I am traveling; I'm in the UK for work and then a bit of a holiday. Many people are surprised when they see the working environment of professional astronomers. Often, they are often non-descript buildings on a university campus, looking like an office block or tower. Inside are long corridors (often dark) and the sign that it is not actually a centre for selling insurance is the lax clothing and posters on the wall. However, some observatories have a bit of style, and I've been working at two of my favourites in the UK. 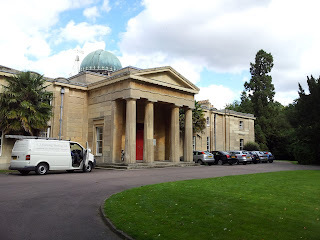 The first is the Institute of Astronomy at the University of Cambridge. It is my old stomping ground and I really like it. So, here's some pictures, firstly, of the old observatory building. This is where Arthur Eddington (and other directors) used to live, and over on the far right-hand side is the lawn were croquet is played and where this famous photo was taken when a certain scientist came to stay. This week was the Eureka prizes and so Anthony Conn and I got dressed up for the dinner. I think we polish up quite well! But alas, we didn't win, but it was a fun evening. One of the things we had to do was make a short movie which would have been played had we won. As it was not, here it is for your enjoyment. Why do all my posts start with an apology for how busy I have been? Ah, the life of the academic. Anyway, time is busy, as I am teaching our advanced class electromagnetism, and next week we have the dinner for the announcements of the Eureka awards. 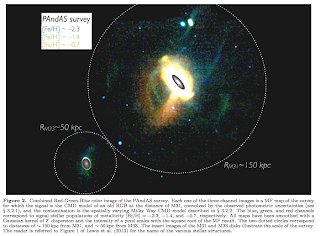 So, a relatively quick post today presenting a new PAndAS paper. The paper, written by Jovan Veljanoski of Edinburgh's Institute for Astronomy, focuses on two smaller members of the Local Group, namely NGC 147 and its close companion, NGC 185. These two galaxies look like they are a binary pair and are in orbit around Andromeda. NGC 185 and 147 can be seen at the top of the picture (they are actually in the constellation of Cassiopeia). Clearly 147 (on the right) has tidal debris coming off it, due to its interaction with 185, or even due to a larger interaction with Andromeda itself.